Pakistan Media Blackout of Ethnic Pashtun Rally Triggers Outrage - Integration Through Media ....! 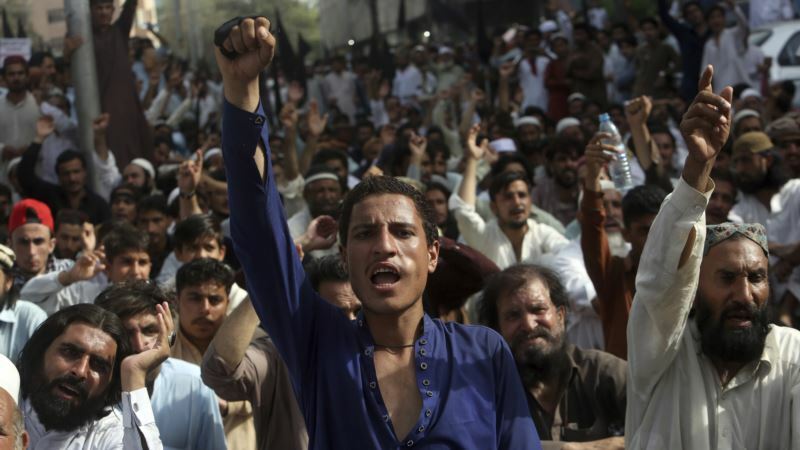 (VOA): Television stations in Pakistan are under fire for their continued black out of peaceful rallies by an ethnic Pashtun movement against extra judicial killings and enforced disappearances of Pashtuns, particularly those living in the volatile tribal areas bordering Afghanistan. The Pashtun Tahafuz (Protection) Movement organized its latest rally this week in the northwestern city of Peshawar, with thousands of people in attendance, including women. The movement is being led by a 26-year-old tribesman, Manzoor Pashteen from South Waziristan, one of Pakistan’s seven semi-autonomous Federally Administered Tribal Areas, commonly known as FATA. Pashteen said while addressing Sunday’s rally his community is calling for their constitutional “right to live without fear”. He emphasized again PTM is a peaceful movement and its demands are constitutional. Participants carried portraits of relatives they claimed went missing during years of counterterrorism military operations in FATA, suspecting they were in official custody for alleged links to militants. The protesters reiterated their call for authorities to clear mines planted in their areas during security operations. The tribesmen have also been complaining of harassment of their religiously and culturally conservative families at security checkpoints and imposition of frequent curfews in FATA while hunting militants. They say an entire tribe is being collectively penalized under existing laws. While some mainstream newspapers, mainly English language dailies, prominently covered the rally in their Monday editions, dozens of news channels, official and privately-owned, gave little to no airtime to the rally. Government officials and the state-run Pakistan Electronic Media Regulatory Authority said they had nothing to do with the media blackout of PTM’s rally, prompting speculations the powerful military could be behind stifling the coverage. Human rights defender Tahira Abdullah condemned the media blackout for not reporting on the rally “out of fear of the establishment.” The term “establishment” is used in Pakistan for military-led security institutions. Private Dawn TV’s political talk show host, Mubashir Zaidi, says the media blackout of Sunday’s significantly big rally was unprecedented. “Somewhere someone powerful conveyed it to media outlets not to cover the rally or the media directors themselves decided not to air the rally for some unspecified reason,” Zaidi lamented. “Whatever happened was unfortunate. It will further strengthen the belief that media is controlled,” he added. Military spokespeople were not available to comment on allegations whether the institution is orchestrating the media blackout. The movement has generated a lot of sympathy in neighboring Afghanistan where Pashtuns are the largest ethnic group. Active users of social media and social activists supported the PTM on their accounts. The rally received considerable coverage by all mainstream TV and radio channels. In addition to news the coverage in news bulletins, TV and radio channels like Zhwandoon and Shamshad held talk shows and broadcast recorded speeches of the PTM leadership in Peshawar. The general added the number of security check posts in FATA and elsewhere in Pakistan has fallen, but they cannot be removed altogether. “The soldiers are deployed at these posts to protect the public, not themselves. But they will remain posted there until the threat of terrorism is eliminated,” Ghafoor said. The PTM actively emerged on the national scene in January to demand justice for a 27-year-old Pashtun man, Naqeebullah Mehsud, from FATA who was killed in the southern port city of Karachi. A police officer, Rao Anwar, who allegedly ordered Mehsud’s killing is currently under investigation for more than 400 extra judicial killings. Anwar denies the charges against him. Pakistan’s mainstream political parties have called for engaging the PTM in a political dialogue to help address grievances of trible populations. But they have for unexplained reasons instructed their workers not join Pashteen’s rallies. Observers insist that issues PTM has been raising could be tackled effectively only when regular laws of Pakistan are extended to FATA through proposed political reforms and the region’s merger with the nearby Khyber Pakhtunkhaw province. FATA became the frontline in the war against terror and militancy since the United States and its allies attacked Afghanistan in 2001. Militants from al Qaida, Taliban and others took refuge there as they fled Afghanistan. Local militants known as the Pakistani Taliban also had established strongholds in the mountainous terrain. Since joining the U.S.-led military alliance, Pakistan has deployed around 200,000 troops in FATA to secure its long, but largely porous Afghan border. But the areas are still governed under British colonial era regulations, leaving the local population without access to many fundamental rights or to the country’s judicial or policing systems.